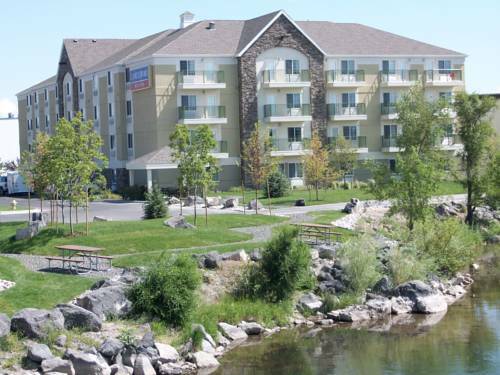 Our extended stay hotel is located across from the Snake River Landing Area, just minutes from local attractions and businesses. Travelers who are visiting Idaho Falls for leisure can enjoy the close proximity of the Snake River to our extended stay hotel. The Snake River Greenbelt, the Falls and a variety of local parks are great for exploring nature. The Museum of Idaho, the Idaho Falls LDS Temple Visitor's Center and the Taurphaus Park Zoo are also a short drive from our hotel. For those who love to shop, Snake River Landing and the Grand Teton Mall are both nearby. Our Idaho Falls hotel's location is perfect for those in town for business or relocation. Nature's Path, Mountain View Hospital, Eastern Idaho Regional Medical Center, Idaho Falls Surgical Center and many other businesses are just minutes away. Each of our guest suites features an executive work desk and free high-speed Internet access to help you conduct business while you are on the road. Guests of our pet friendly extended stay hotel in Idaho Falls can enjoy fully equipped private kitchens, complimentary guest laundry facilities and a 24-hour fitness center. The Candlewood Cupboard in the lobby offers a variety of food and sundry items for purchase. During your next extended stay in Idaho Falls, consider our hotel home. Located in Snake River Landing, Bella Vita Coffeehouse offers a fine selection of coffee, tea and other refreshments. Come try our soups, sandwiches and salads, pastries, cheesecake and muffins. When you're in the mood for good times and great cuisine, be sure to check out Smitty's Pancake and Steak House in Idaho Falls. The restaurant is located in one of the area's most pleasant settings and is known for its delightful staff and superb cuisine. Burgers and Steaks with the freshest ingredients. A great local favorite, even Harrison Fork checks this place out on a regular basis. Non smoking restaurant with beer and wine menu. Children's program - There are many things to do in Idaho Falls including Blast Off Fun Zone, Grant Teton Mall, Tauphtaus Park Zoo and Fun land, Museum of Idaho, and many biking and hiking paths. - Idaho Falls and "Green Belt"
~25 miles from Idaho Falls. ~47 miles from Idaho Falls.